3 lines of 4-5 players warm up in short, quick repetition movements prior to a game or training session. Have your team captain lead the way calling out the variety of movements. 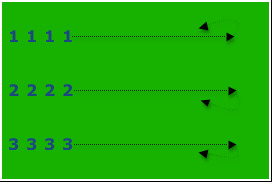 - Set up this 3 lines by putting your team into lines of 3, with 4-5 players in each. - Mark a starting line, and a line to turn at approximately 10-15 yards apart. - Have your team captain run the team through the exercise. - Players jog as a group, in lines of 3, from start line to end line, turn and jog back in their lines. - Exercise should be sharp and quick. - Variety of activities can be done: knee's up, side skips, short sprints, jog backwards, etc. - Increase speed/sharpness as players get warmed up. - 7-10 minutes for this 3 line warm-up drill.